View the information handout and detailed maps for each site. The Omaha Municipal Land Bank is seeking community input about the future development of several properties in the 40th & Hamilton area. While we are out talking to the neighborhoods about our sites, we are also gathering input about potential future development of the western portion of the Walnut Hill Reservoir. The goal of this outreach is to understand neighborhood priorities for development at these sites, in as much detail as possible. For the sites we own, we will use this information to create development guidelines. These development guidelines will be part of the Request for Proposal (RFP) we send to developers when we’re ready to sell the property. 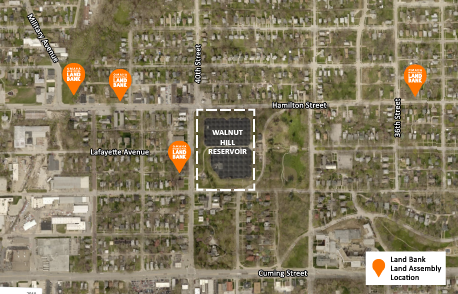 We will share the information we have gathered about Walnut Hill Reservoir with Metropolitan Utilities District (MUD) to help inform a potential future development plan. The Land Bank is committed to keeping you informed throughout the process; please reach out any time with questions or concerns! You can email info@omlb.org, call us at 402-800-1240 or submit a comment on our comment form. We value the input of our community partners and neighbors and would love to talk to you about what we do and how we can do it even better!